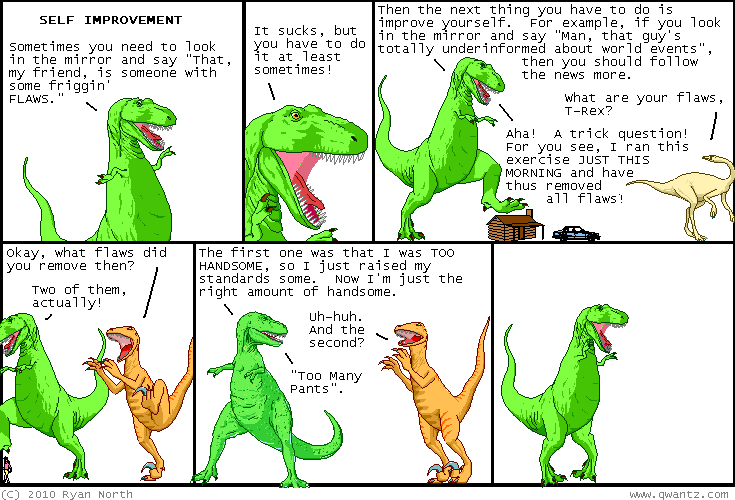 Dinosaur Comics - March 12th, 2010 - awesome fun times! –No wait! Better: a PUPPY hospital! March 12th, 2010: I want to link you to the fantastic comics of Jason Shiga, who is both a gentleman and a comics genius. I just picked up Meanwhile, a choose-your-own-adventure comic that branches like crazy AND features both time travel and a doomsday device. It's impressive both in terms of content and structure - really awesome! I really recommend it! But if you're not reading this at a bookstore where you can pick up "Meanwhile" right now, I'd recommend reading his Fleep to tide you over until you do find yourself in this bookstore! One year ago today: TWO WAYS TO MAKE NEW FRIENDS. just two.